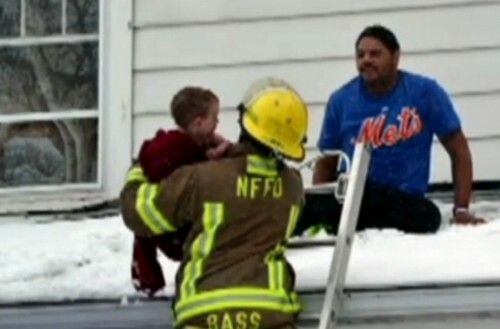 What would you do if you looked out your window to find a toddler sitting on top of your neighbor’s snow-covered roof? Antwan Moore says he saw this exact incident on the roof of his neighbors across the street. What did he do? 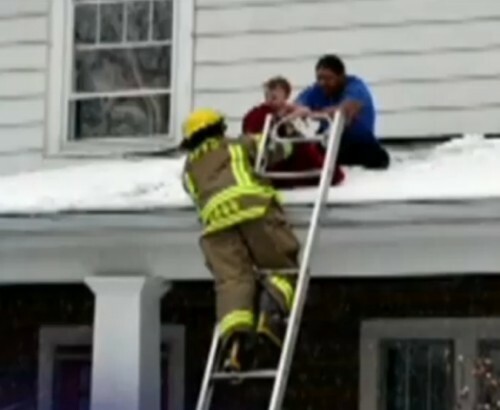 He climbed on top of the roof and sat with the child until emergency personnel could arrive. Just before 10 a.m. in Niagara Falls, Antwan’s girlfriend, Amber Haley was heading out the door to take their dog to the vet when she suddenly heard a strange sound coming from across the street. What was most frightening, Amber said, was the fact that the little boy, dressed only in a diaper and a pair of socks, was slipping on top of the snow-covered roof. “He was, like, walking around, and moving. Then he slipped a couple times and I screamed a couple times, and then I just started screaming for help,” Amber said. Her screams would alert Antwan, who quickly jumped into action. He bolted across the street, and then, with the help of someone who happened to be in the area, he climbed up on top of the roof with the little boy. He then wrapped the little boy in a sweatshirt to keep him warm until emergency personnel could arrive. “Seemed like longer than that, but it was like 10 minutes until first responders got there,” Antwan told WGRZ.com. Niagara Falls fire and police are considering Antwan for a community award and have hailed him a hero. But Antwan says he was only doing what he had to. “Seeing the baby, I thought about my son being up there on that roof, did what I had to do,” Antwan said. 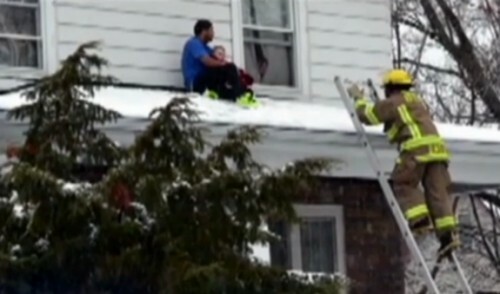 Firefighters speculate that the toddler’s 4-year-old sister opened the second story window. Both children had been left unattended while the father slept on the couch. He was brought in on charges of endangering the welfare of a child, and has since been released. Child Protective Services have also been called in to investigate the matter further. Best of 2012 – Bravest Heroes!